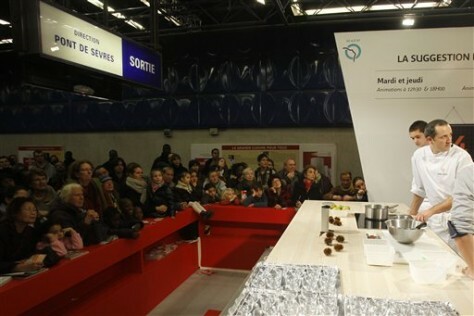 The crowd watches Chef Andre Loutsch, right, cooking pastries in a Paris subway station, on Nov.24. Renowned Paris chefs took to the platforms of the Miromesnil subway station in a three-day series of cooking demonstrations and samplings. With a different theme and chef for each segment, French commuters had the oppurtunity to learn how to make, and to taste, many dishes, such as poached hake fish, calamari risotto, and fruit-filled crepes.